Size:S _ US:4 _ UK:8 _ EU:34 _ Bust:98cm/37.8" _ Sleeve:59cm/23.2" _ Length:66cm/26.0"
Size:M _ US:6 _ UK:10 _ EU:36 _ Bust:104cm/40.2" _ Sleeve:60cm/23.6" _ Length:67cm/26.4"
Size:L _ US:8 _ UK:12 _ EU:38 _ Bust:110cm/42.5" _ Sleeve:61cm/24.0" _ Length:68cm/26.8"
Size:XL _ US:10 _ UK:14 _ EU:40 _ Bust:116cm/45.7" _ Sleeve:62cm/24.4" _ Length:69cm/27.2"
Other's Products: Baby clothing, baby shoes; Women clothing, such as t shirts, leggings, tank top, dress, swimsuits etc. Adults shoes, such as sandals, casual shoes, sneakers, flat loafers, slip-slops, slide slippers etc. If you want all kids of style products, welcome to visit our store Anxinke, I beleive you will find what you like. 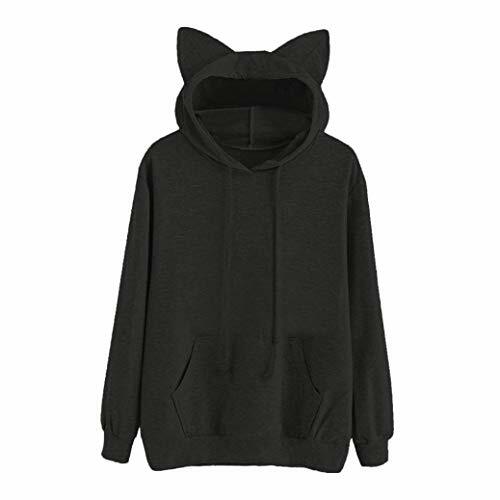 There are many of similar women hoodies on sale in our store, just please visit store Anxinke, we will show you all kinds of style and good products. Notice: This is Asian size, it is a bit small. Please refer to the size details in our descriptions before buying, please choose 1 size bigger than usual. About delivery: Shipped by USPS, usually it only take 10-15 business days to arrive. View More In Speaker Accessories. If you have any questions about this product by Anxinke, contact us by completing and submitting the form below. If you are looking for a specif part number, please include it with your message.